A mum who was told she’d never have children has defied the odds (and smashed a record in the process), delivering an enormous 15-pound baby. If you’re wondering just how big that is, we’ve done the maths – read on! New Yorker, Joi Buckley gave birth to her daughter Harper, who weighed 15lbs 5oz and measured 23 and a quarter inches long. For those Aussies who like their weights and measure in kilograms, that’s a giant 6.9kg! 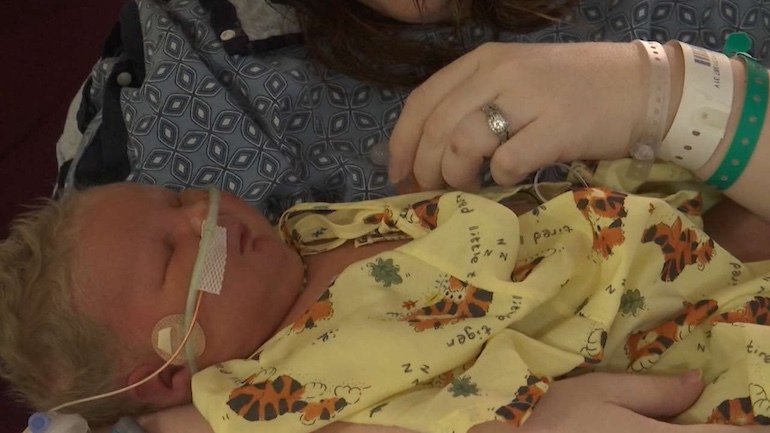 “I knew she was going to be big, but I didn’t anticipate no 15-pound baby,” Joi told WETM. Harper is the largest baby to be born in New York’s Arnot Odgen Medical Centre and mum and dad are over the moon about it. After being told they had less than 15% chance of conceiving naturally, the couple had adopted seven years ago. There has been no confirmation of how Harper was born, however given that the large size of the baby was identified in the last trimester of pregnancy, we’re going to guess it was a c-section. Baby Harper is currently in the Neonatal Intensive Care Unit to monitor her sugar and oxygen but is perfect in every way – including an incredible head of golden hair. Although the miracle child was more than her parents could wish for, mum Joi has said it was tough not to have been discharged already. Get well and get home bubba, you have a whole family to meet! Until Harper heads home her mum and dad want this adorable story to give other couples struggling with fertility hope – miracles can happen! In an interesting twist it’s also been in the news this week about this Japanese baby who was the smallest ever born to go home – see him now and marvel at what an amazing world we live in!